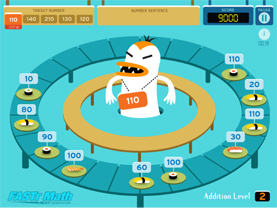 Sushi Monster Presents The Raw Power of Math! 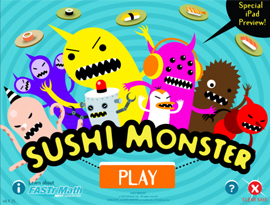 Sushi Monster is a free app developed by Scholastic. It’s a great addition to our roster of educational apps, as its main purpose is strengthen your math muscles (and also dig Scholastic’s hooks just a little bit deeper into your consciousness). The game takes place in a unique Sushi restaurant, where the main chef is a skilled sushi master, who loves math even more than wasabi. The goal is simple: choose the sushi numbers that add or multiply with each other to hit the number displayed at the top. For example, if the number is 33, and you just happen to see a number 3 sushi and a number 11, multiply those together and you’ll have one happy belly. The game is fun and can progress in difficulty quite quickly. There are controls to keep it from getting out of hand, but it’s challenging enough for a wide range of ages and skill levels (I’ll admit it, the game shook some of the rust off my internal calculator). The cartoony graphics are simple, but well suited for the needs of the game. The monsters are a really strange bunch that will definitely elicit laughter. The bottom line is that this app is fun, educational, and whoa! It’s free! So give it a shot and do your best to trick your kids into doing some evening learning. – If I had to choose one drawback, it’s that this game could really become addictive! The game is math-based, so it works for anyone who knows their addition and/or multiplication.